Today is my 4th and final video in my series of video ruler tutorials! It's for my newest (and largest!) ruler, the Super Sidekick. In this video tutorial, I show you how to cut shapes from fabric strips with the Super Sidekick ruler. 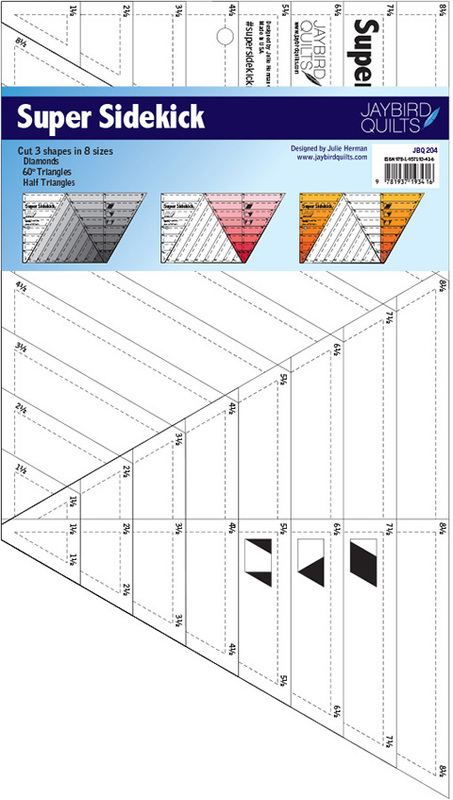 Learn how to cut Diamonds, Triangles and Half Triangles. 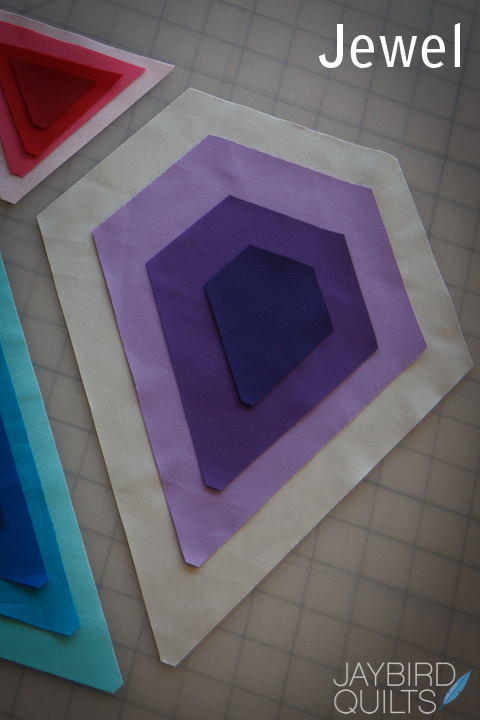 You can cut each shape in eight different sizes using the Super Sidekick ruler. 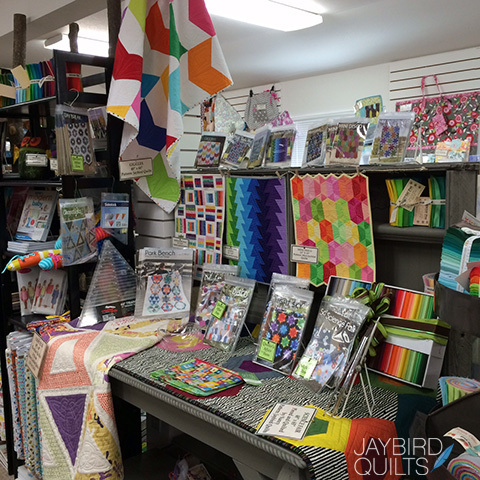 The Super Sidekick ruler is a companion to the Hex N More ruler, also from Jaybird Quilts. 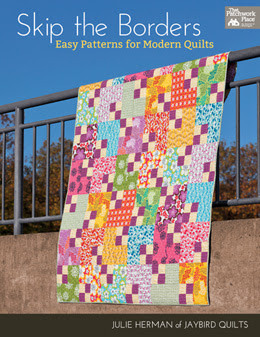 I'll show you how to cut shapes for right and left-handed sewists and quilters. The Super Sidekick ruler cuts 3 shapes in 8 sizes. The Super Sidekick ruler can be used in place of the Sidekick ruler. 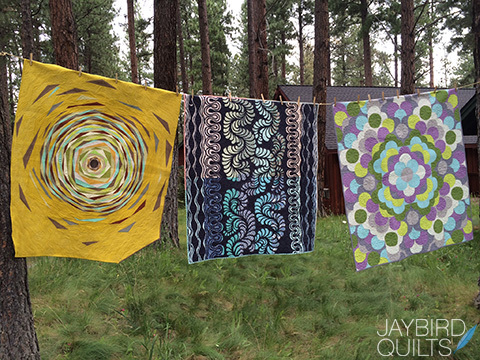 Jaybird Quilts patterns that use the Super Sidekick ruler include Gravity, Glimmer and Stereo. 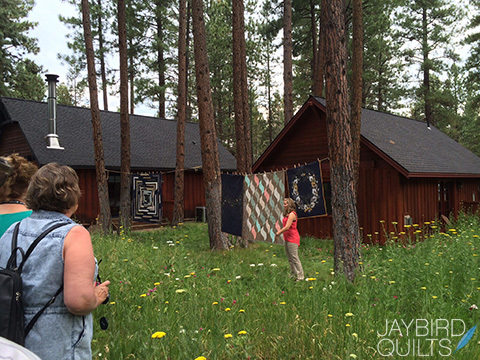 Most Jaybird Quilts quilt patterns include size options that range from baby, lap, twin, full, up to queen and king size quilts. 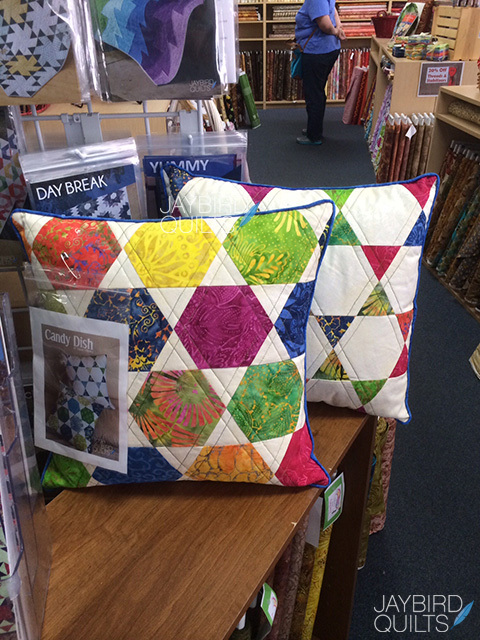 Patterns for throw pillows and table runners or table toppers are also available. All patterns are full color and include detailed cutting diagrams and templates, directions for assembling blocks and finishing directions. 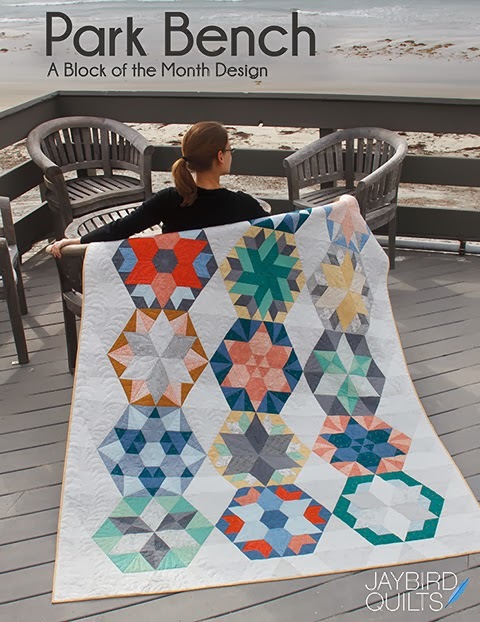 Quilts featured in this video include Glimmer made with Elizabeth by Tula Pink for Free Spirit and Stereo made with Color Theory by Vanessa Christenson of V and Co for Moda. 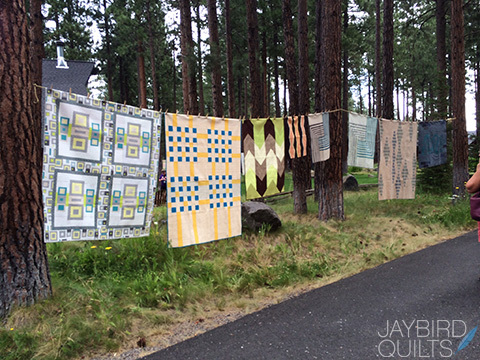 Both quilts are pieced by Julie Herman of Jaybird Quilts and are quilted by Angela Walters of Quilting is My Therapy. And if you've ever gotten stuck when trying to align diamond shapes when piecing, here's a link to my tips on how to get unstuck. What do you think of these ruler video tutorials? Did you find them helpful? Tell us all about your favorite ruler or video tutorial in the comments. I'm back with a new video tutorial for you, this time it's for my Sidekick ruler! The Sidekick is the companion ruler to the Hex N More and they work great together, or just fine on their own. In this video tutorial, I demonstrate how to cut shapes from fabric strips with the Sidekick ruler. 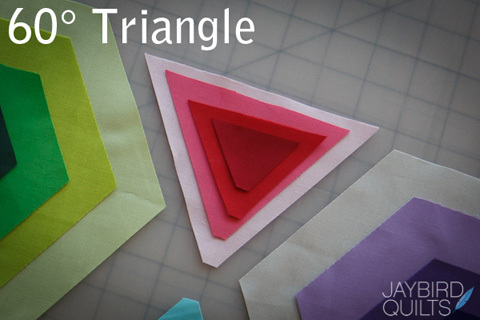 Learn how to cut Diamonds, Triangles and Half Triangles. You can cut each shape in four different sizes using the Sidekick ruler. 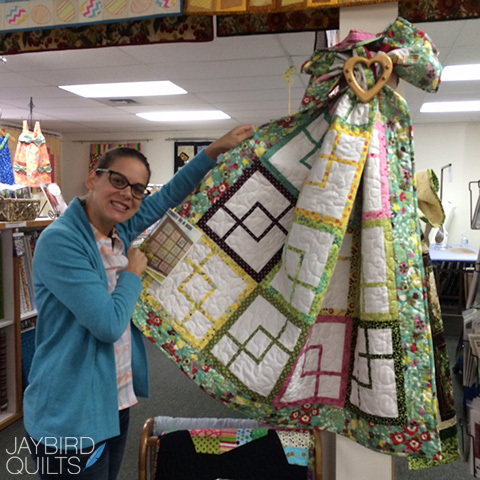 I review how to cut shapes for right and left-handed sewists and quilters. The Sidekick ruler cuts 3 shapes in 4 sizes. The Super Sidekick ruler can be used in place of the Sidekick ruler. 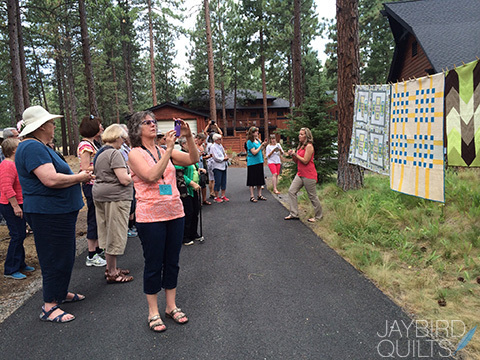 Jaybird Quilts patterns that use the Sidekick ruler include Park Bench, Day Break, Night Sky, Giggles, Rock Candy and Seaside. 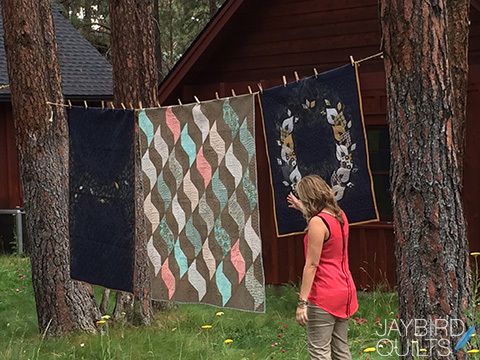 Most Jaybird Quilts quilt patterns include size options that range from baby, lap, twin, full, up to queen and king size quilts. 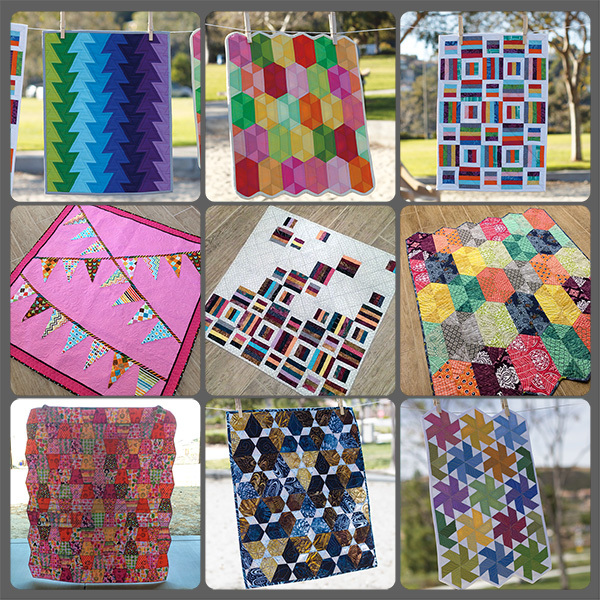 Patterns for throw pillows and table runners or table toppers are also available. All patterns are full color and include detailed cutting diagrams and templates, directions for assembling blocks and finishing directions. 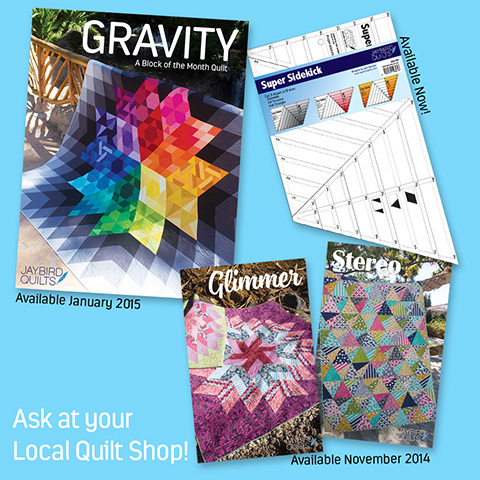 Quilts featured in this video include Night Sky, Giggles and Rock Candy table toppers. 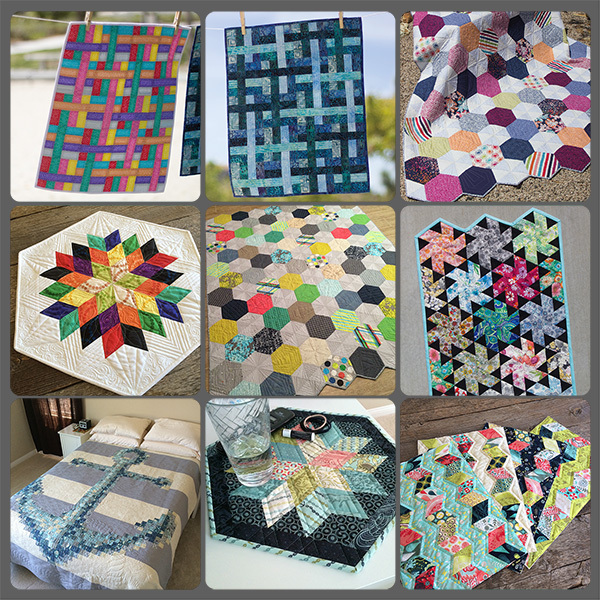 All featured quilts are made with Kona Cotton by Robert Kaufman Fabrics, pieced by me and quilted by Angela Walters of Quilting is My Therapy. What do you think of these ruler video tutorials so far? Do you find them helpful? I've been saving this post for a while now, just shy of about 6 months. 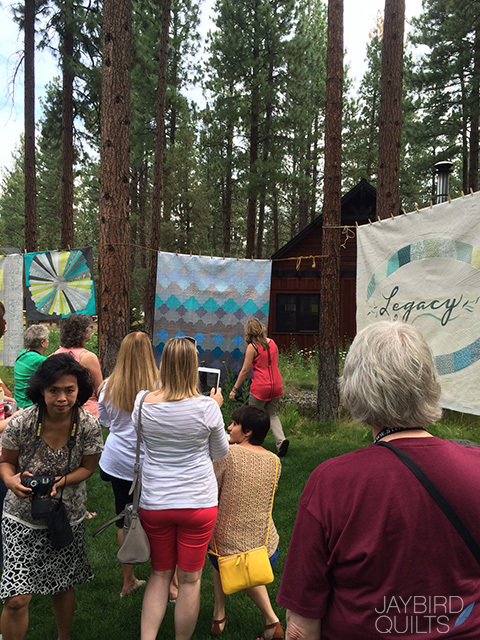 Once I sat on it for as long as I did, I figured I would wait it out until the 2015 Sisters Outdoor Quilt Show + Quilter's Affair announcements were made. 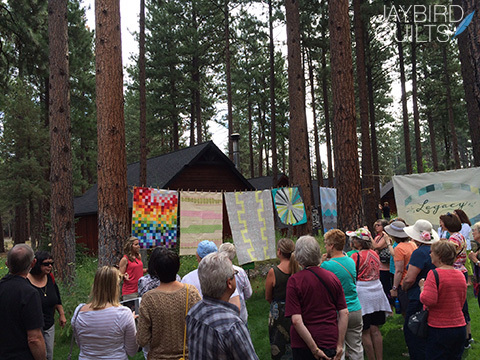 One of the best kept secrets about week of quilting and quilts in Sisters is the "Save it for Sunday" walking tour at the FivePine Lodge & Conference Center. 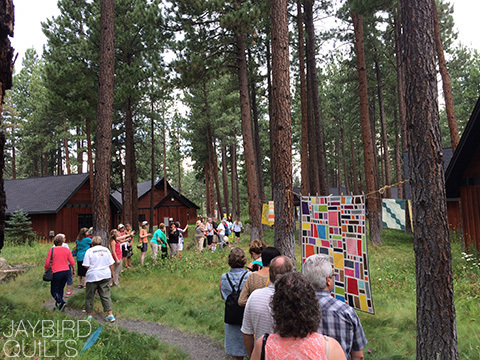 When the weather permits, quilts from the featured presenter are hung up outside among the pine trees for the event. 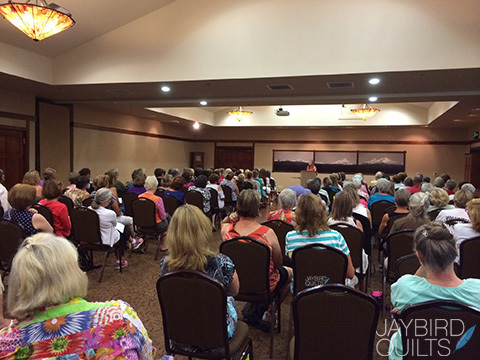 I was lucky enough to attend in July 2014 for Angela Walter's presentation. 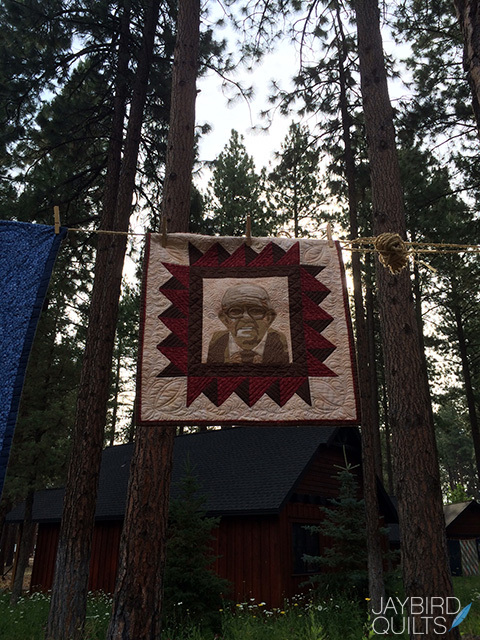 Angela's portrait quilt of Grandpa that she made and hangs in her studio. 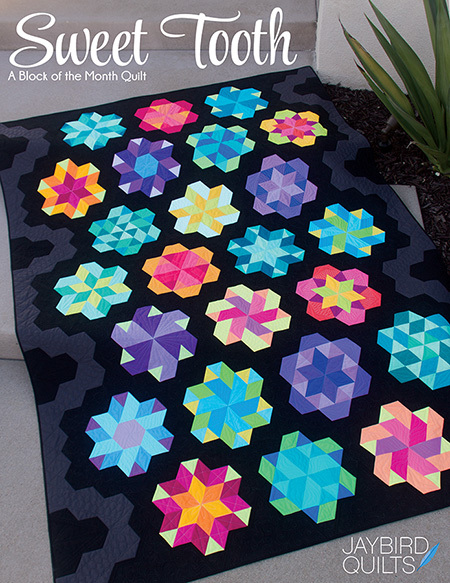 He's the one who got her started on her quilting journey. 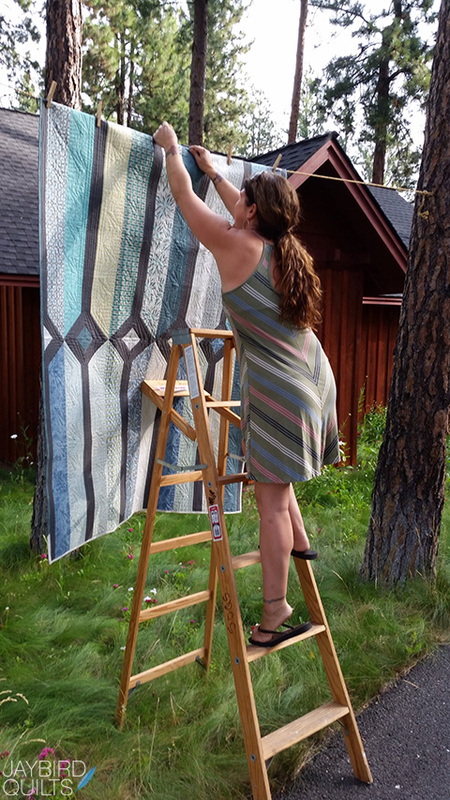 Valori Wells hanging quilts to get them ready for the tour. 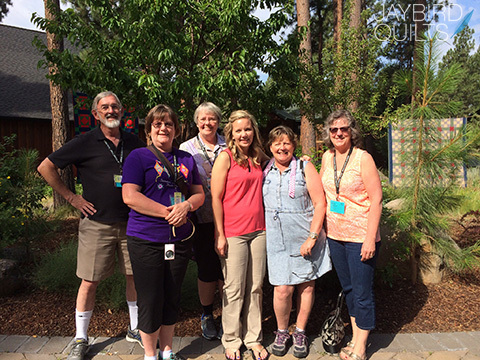 Some of the quilters who took Angela's tour. 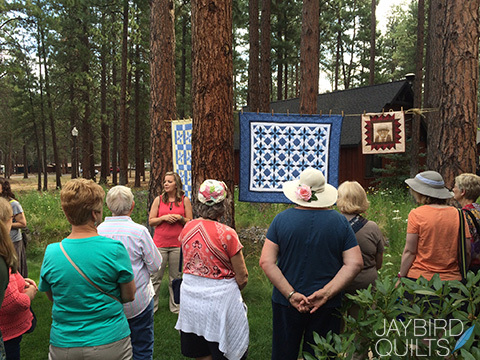 Angela did a great job sharing her quilting stories that day. 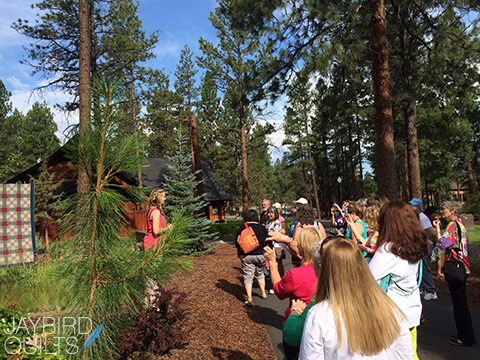 You can find out more about that day and her experience on her blog. 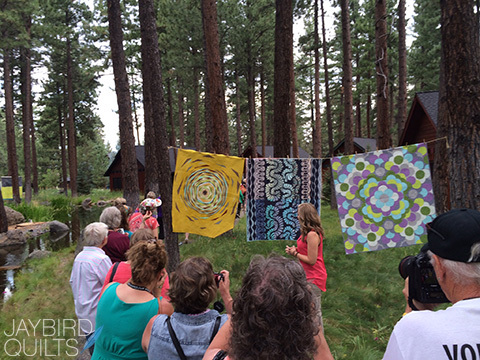 Some of my quilts that Angela has quilted, from left to right: Science Fair, 2 Night Sky quilts and Day Break. 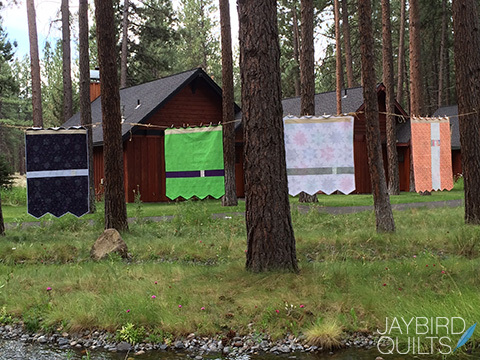 My quilts from behind. I love seeing the pieced backs and labels. Angela presenting in the packed lecture hall after the walking tour. 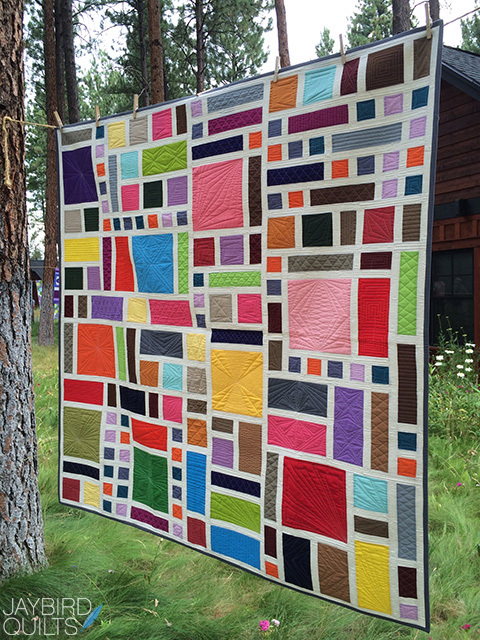 This is my Radio Way quilt made with Cocoon by Valori Wells and quilted by Angela. 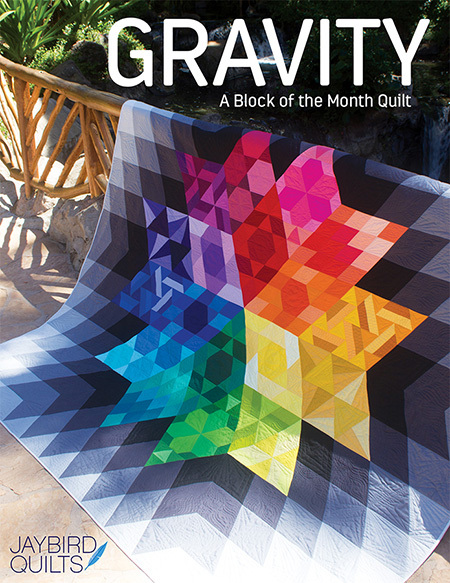 I donated this quilt to the "Men Behind the Quilts" calendar and quilt auction. 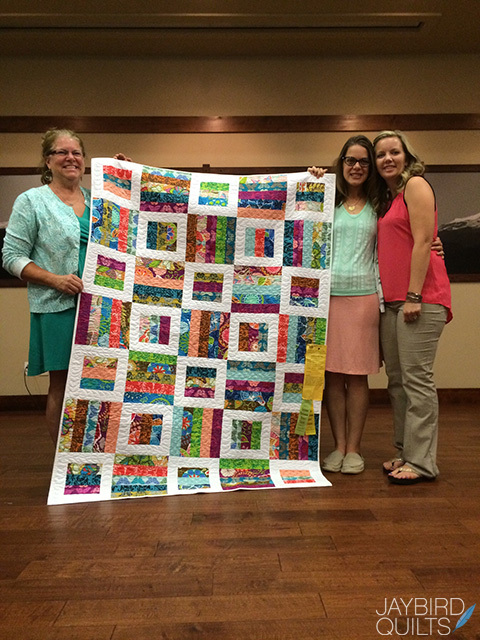 Angela and I are pictured here with the quilt auction winner. 'Save it for Sunday' was a pretty cool experience I'll never forget. 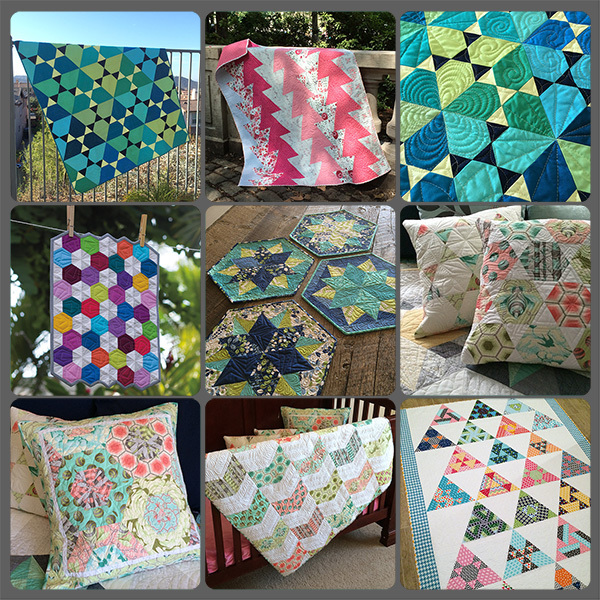 And I'm REALLY looking forward to the 2015 Save it for Sunday event with one of my all time favorite fabric designers, Tula Pink! 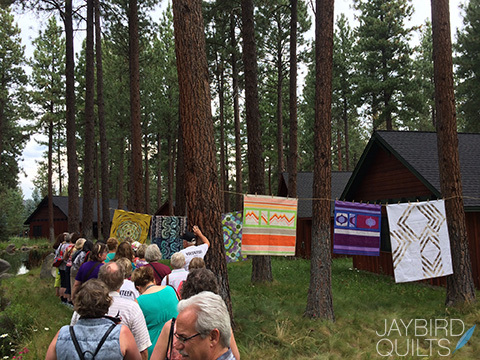 Do you have a favorite quilting event that holds a special place in your heart? 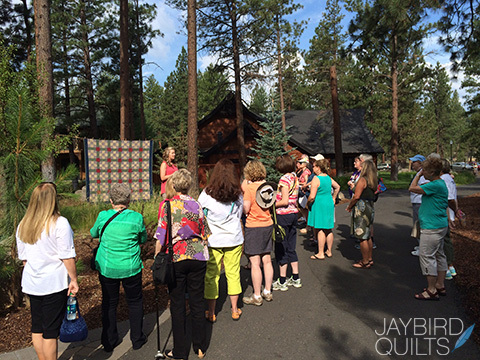 Are planning to head to Sisters this year for the 40th anniversary outdoor quilt show? Tell us all about it in the comments below. I'm so excited to share my new video ruler tutorials with you this month! Today I have the Hex N More video tutorial for you. Over the next few weeks I'll have a new tutorial on each ruler for you each week. 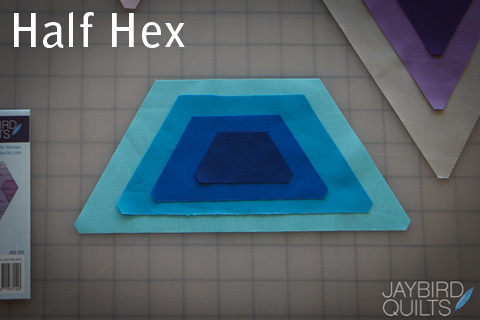 In this video tutorial I demonstrate how to cut shapes from fabric strips with the Hex N More ruler. 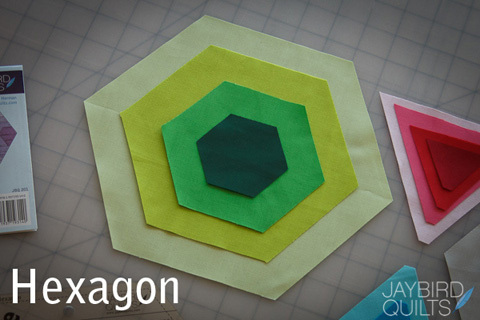 Learn how to cut Hexagons, Half Hexagons, Triangles and Jewels. 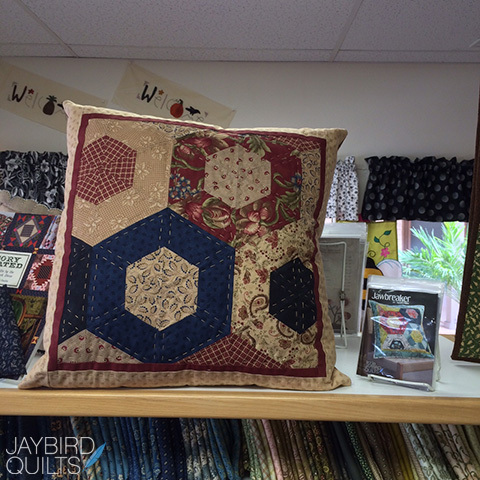 You can cut each shape in four different sizes using the Hex N More ruler. 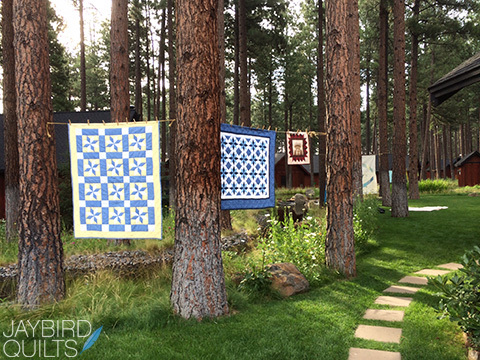 I review how to cut shapes for right and left-handed sewists and quilters in the video. The Hex N More ruler cuts 4 shapes in 4 sizes. The Hex N More ruler can be used in place of the Mini Hex N More ruler. 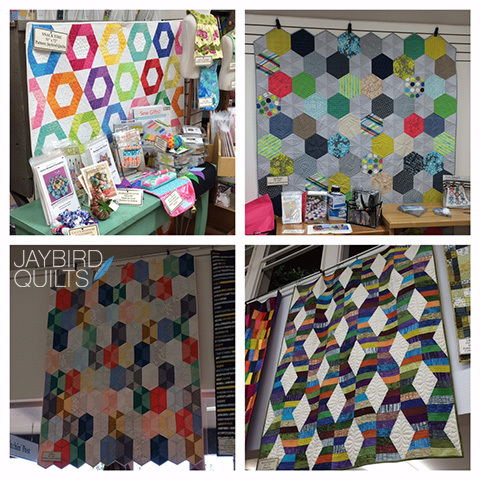 Jaybird Quilts patterns that use the Hex N More ruler include Gravity, Park Bench, Toes in the Sand, Delight, Disco, Day Break, Science Fair, Tiny Dancer, Snack Time, Wonton, Lotus, Northern Lights, Tasty, Jawbreaker and Candy Dish. 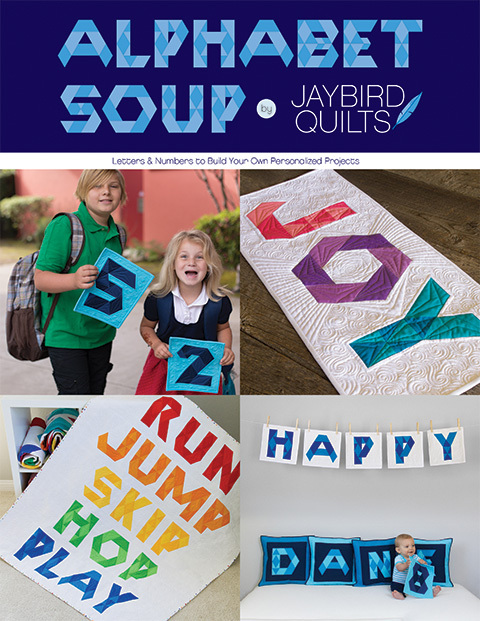 Most Jaybird Quilts quilt patterns include size options that range from baby, lap, twin, full, queen and king size quilts. 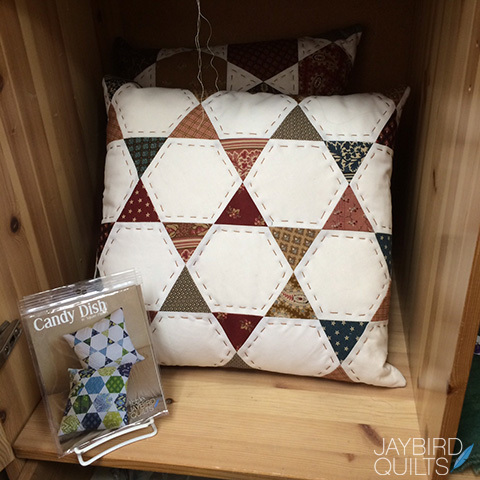 Patterns for throw pillows and table runners or table toppers are also available. All patterns are full color and include detailed cutting diagrams and templates, directions for assembling blocks and finishing directions. 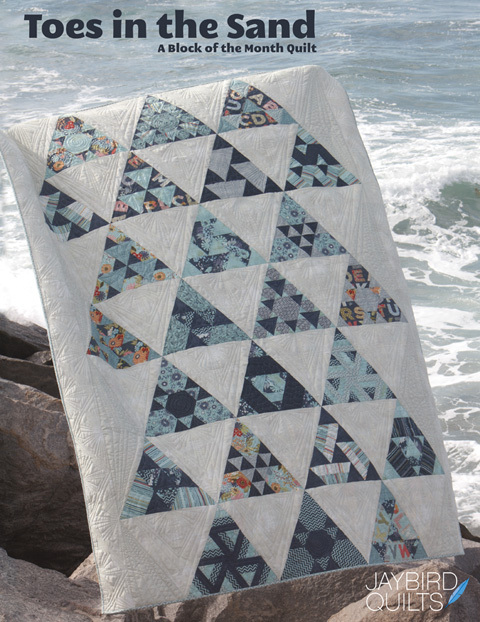 Quilts featured in this video include Delight in Moonshine by Tula Pink for Free Spirit and Snack Time in Kona Cotton by Robert Kaufman Fabrics. 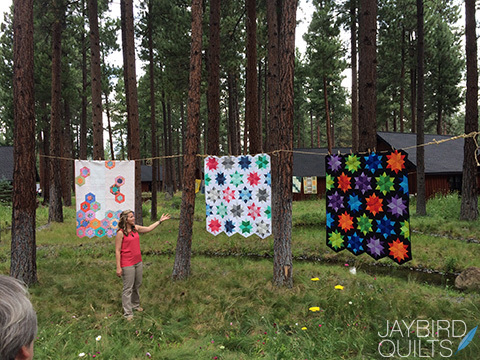 Both quilts are pieced by Julie Herman of Jaybird Quilts and are quilted by Angela Walters of Quilting is My Therapy. Bookmark this page to save this tutorial for future use. 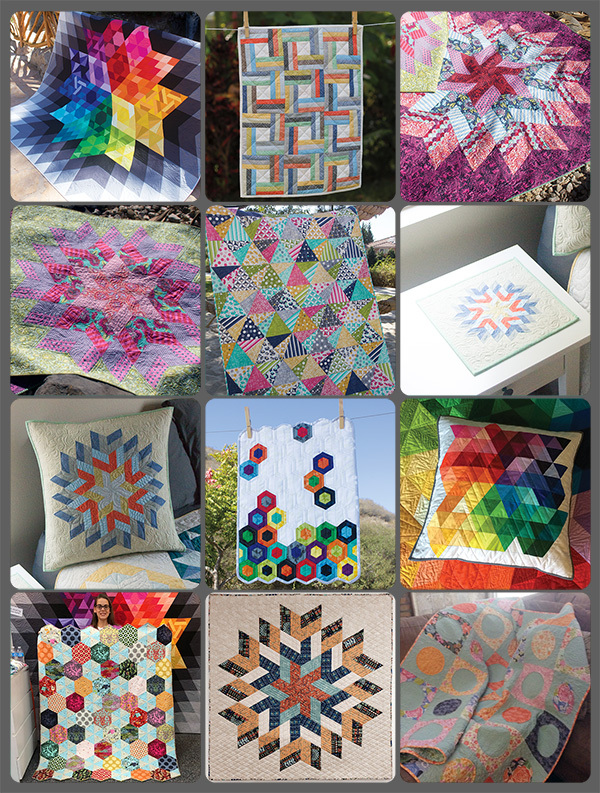 While I technically finished more quilts in 2014 than 2013, I feel like I didn't create as many. 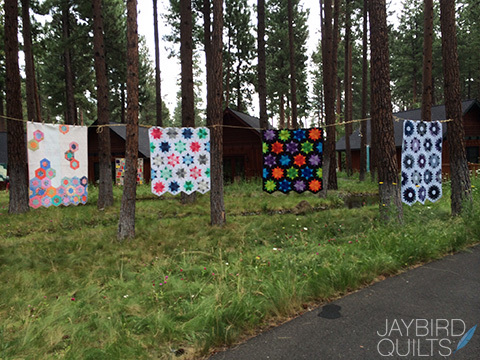 That is probably because 22 out of the 39 of quilts are minis, pillows or small projects. Looking back, I know I probably didn't finish as many of them as I did in past years because we moved + have been planning our upcoming wedding. I have no regrets with what I created in 2014 & I'm excited to see what 2015 has to hold! 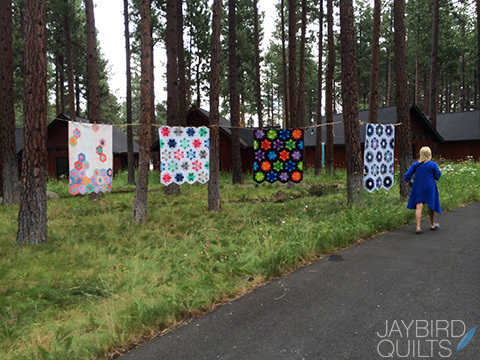 I'm excited to see what quilts I finish in 2015!